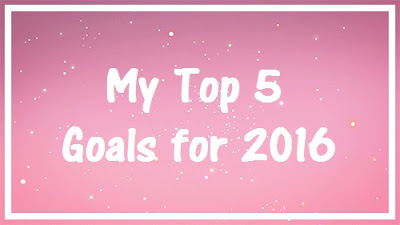 I put up a voting poll on both my twitter and my tumblr and a more than half of the votes I received were for me to do more personal-like blog posts this year so I thought I would share with you all my Top 5 Goals for 2016. Move home: This has been something I've mentioned quite a lot for a while now, and I know I said when we moved into our home nearly two years ago that we were going to buy it.. well that didn't happen as the person who we are currently renting it off wants now a silly amount of money for it - even though we have spent over £10,000 modernising the house. We've decorated every room, re-done flooring in most rooms, basically put a brand new kitchen in the house, completely re-done the gardens, and much more. Unfortunately we can't get our money back and in our eyes it's not been wasted by doing someone else's home up and added a lot value to a really old run-down house. We are gutted. We have decided that we are going to move home and we are going to move back into the Liverpool area where I was brought up as a child. We spend a lot of time there anyway, so it would save us a lot of petrol going to and from Liverpool. It's going to be a massive change in our lives so we are hoping that we can find a nice, big, beautiful home to spend the rest of our lives in. Have a baby: Another massive thing which is going to change our lives is that Phil and me are planning to have another baby. I'm going to keep this very brief as it's a very personal situation between Phil and myself, but if you didn't know already Phil and me sadly lost our baby girl at 17 weeks pregnant on 25th December 2013. By this time next year we are hoping to have another baby, either that or at least be trying. Because of my medical health we have to go through a lot to even get to the point where it will be safe for both me and a baby to be alright during a pregnancy. At the moment I need a couple of tests done before we can actually start trying again. Save some money: I say this so many times whenever I do goal blog posts but I really want to save some more money so that we can get a new home and then actually buy it first and then do it up so we don't end up wasting thousands of pounds like we already have done. Plus having a baby is pretty expensive too. Read at least one book a month: I have a book-list to size of my whole body and I never make time to read them, so in 2016 I have made a goal for myself that I will read at least one book a month and then maybe do a review blog post on them so you can see what I'm reading and interested in. If you'd like to recommend me your favourite book or just another which you think I may enjoy then please get in touch and let me know what it is. Start doing FOTD's: I've said for a while that I'm going to start doing FOTD's and never always forget so I thought that this year I have a goal to at least post three FOTD blog posts a month. If there are any FOTD or makeup looks you would like to see then get in touch with me. I hope you all enjoyed this blog post and got to know me a little bit more. If you have any questions please comment below or tweet me. If you'd like to ask me a question on my tumblr or you want to ask me a question anonymously then you can do so here. I'm sorry to hear about your baby girl, I can't imagine how heartbreaking that must have been. I hope 2016 is so much more kinder to you both than previous years have been. I wish you and your partner bundles of happiness & health in 2016. Best wishes to you in 2016 - after the first few goals, reading a book a month sounds relatively easy! I hope you find everything you're looking for this year.